Falke Pisano typically produces her work in cycles centered around a specific research interest. Her practice involves a sustained, in-depth analysis of ideas selected from works of literature, history, and theory, which she transforms into multimedia artworks. For Freedom of Movement, Pisano presents two works from her ongoing series VONDERVOTTEIMITISS, which she began in 2017. Artworks in this cycle start as sculptural installations that integrate posters, PowerPoints and other materials, which Pisano then activates through public lecture-performances. 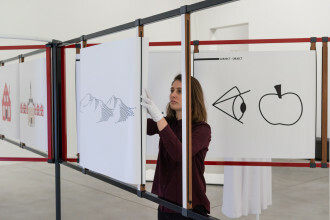 The installations continually evolve as they are exhibited in different environments, with the artist adapting the work to each unique institutional context. Through questioning concepts we believe to be self-evident, such as space, time, and language, Pisano’s work interrogates the purported objectivity of Western civilization’s philosophical roots. For her new performance and installation No Man’s Land, Pisano takes as her starting point Virginia Woolf’s 1929 short story “The Lady in the Looking Glass: A Reflection,” which describes a woman attending to her house and garden through the objects reflected in her dressing room mirror. While the story suggests that a person’s private character can never be understood through physical objects, in her lecture-performance, Pisano adds a new dimension to this interpretation by arguing that spaces we think of as neutral are in fact charged with cultural significance. The artist also connects Woolf’s story to scientific advancements of that era, including the discovery of atoms, which proved that space was not a void but rather full of active matter. Following Pisano’s November 25th performance at the Stedelijk Museum, the diagrams, projections, and illustrations from her presentation—as well as a recording of the lecture-performance—will be installed as a multimedia sculpture in the gallery. Pisano’s performance and installation Wonder-What-Time-It-Is resembles No Man’s Land in its formal structure and engagement with literature. The work is organized around Edgar Allan Poe’s 1839 satirical story “The Devil in the Belfry,” which takes place in the fictional Dutch village of Vondervotteimittiss. Chaos ensues after a foreigner enters the town, attacks the bell-ringer, and rings thirteen o’clock, thereby disrupting the ordered, predictable lives of the town’s inhabitants. Pisano uses the story to discuss the standardization of time during the nineteenth century, and its connection to industrialization and imperialism. Also, she is attentive to how xenophobia can arise from resistance to alternative knowledge frameworks. Wonder-What-Time-It-Is has continually transformed since its first presentation in 2017, and will appear in Freedom of Movement as a wall-based installation alongside a video version of the original performance. Falke Pisano, "Wonder-what-time-it-is", 2017, performance/installation, Playground Festival 2017, Museum M, courtesy Ellen de Bruijne Projects, Hollybush Gardens and the artist, © Robin Zenner. This work shows us how Western concepts of time and space structure the very foundations of our everyday reality. Through short stories written by authors that are now firmly embedded in the Western “canon,” Pisano questions the belief that such concepts are dissociated from culture and history, drawing attention instead to the ways in which they impose order and perpetuate a colonial agenda. Falke Pisano (b. 1978, Netherlands) studied at the HKU University of the Arts Utrecht and the Jan van Eyck Academie in Maastricht. She has participated in residencies at NTU CCA, Singapore; M4gastatelier, Amsterdam; the American Academy in Rome; Capacete, Rio de Janeiro; and the Henry Moore Institute, Leeds. Her work has been exhibited and performed at venues including Praxes Center for Contemporary Art, Berlin; The Showroom, London; De Vleeshal, Middelburg; Grazer Kunstverein, Graz; the Berlin Biennale; BAK, basis voor actuele kunst, Utrecht; De Appel Arts Centre, Amsterdam; the Venice Biennale; Museo Reina Sofia, Madrid; the Biennale of Sydney; Manifesta 7; and the Istanbul Biennial. In 2013 she was awarded the Prix de Rome.